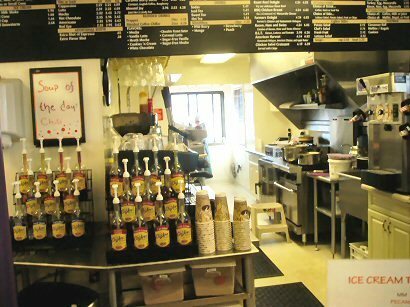 In last Friday’s brain dump I mentioned Roselen’s Coffees and Delights, a drive-thru coffee shop in the Arthur, Illinois Amish community. Roselen’s is operated by Amish sisters Rose Plank and Lena Otto. I guess we can figure out where the shop’s name comes from (but why did poor Lena have to lose her “a”?). Alice Aber has shared some photos of Roselen’s, which she visited this past week. Alice says she told them about last week’s blog post on the shop, after which “they beamed from ear to ear”. She also had a chance to drop by Beachy’s Bulk Foods and Yoder’s Restaurant while in the Arthur community. Anyway, enjoy a few shots of Roselen’s and the Arthur Amish settlement, courtesy of Alice. And enjoy your leftover turkey! Roselen’s is just one example of a local Amish business. The Arthur settlement is highly entrepreneurial. Amish businesses in the Arthur area range from dry goods shops to metal workers to engine repair. But above all the most heavily-represented enterprise among local Amish is woodworking. I would ask them, but I do not reside in that area, alas! I suppose, one could ask the sisters why they did drop the’A’, it would be the start of a good conversation. After all, people are wondering, and I am one of them. Loving the familiar sights. I’m not much of a black Friday shopper but I could sure use a good cup of coffee. Thanks, Alice and Erik for posting. Erik, the one with the picket fence that was so blurred was what you would see walking through the door. I was taking the picture on the way out, trying to balance coffee, bags and camera, and trying to get out of someone’s way as they were coming in. It was sort of an after-thought to take it. I know it was blurred but thought you might like to see it anyway, LOL. For those who might come to Arthur and want to find Roselen’s it is located on 133 in front and the same building as the Dollar General store which is the next parking lot over from Yoder’s Restaurant. We almost missed it heading east on 133 as the sign faces the east rather than north directly towards the highway. Elizabeth I think going shopping today amounts to self-torture! Looks cute! I’ll have to make a mental note of that if I ever go through that way. We are ALL about coffee out here in the Seattle area! We eat at Roselen’s every time we are in Arthur, which is twice a yr. They serve delicious sandwiches as well as frozen yogurt. Try the Pumpkin flavor ice cream. We always shop Beachy’s Bulk foods and Discount Food store. There is good buys there and sometimes the prices aren’t competitive on other items. It is just a matter of being observent. We have been going to Arthur for yrs to the Tri-County Auction held on Yoder’s farm. It is always the last Sat of March and Sept. It is amazing how many of the local people apppear to not be familiar with this event. Thanks so much for sharing your pictures of Roselen’s in Arthur, IL. I come from New England and have been to Lancaster County numerous times but would really love to take a trip to Arthur and surrounding Amish communities. First I need to figure out how to get there from here! Any tips on places to stay within this Amish settlement? Hi Morinne, you are most welcome. I hope to take some more pictures next month. There are some bed and breakfasts in the area as well as motels. If you email me your snail mail address I will be happy to pop some tourist booklets in the mail to you after I go back down to Arthur next month. I will pick them up at the tourist center for you. My email address is ceramics_lady@mchsi.com Where in New England are you? I am from NY state originally. Hi Alice, Thank you for responding to my posting. I have sent you my address and would appreciate anything you could send me about Arthur and surrounding Amish areas. Hi Morinne, got your email. No problem at all. Weather permitting I am looking about somewhere between the 8th and the 12th for going down, but I will keep you posted. I must say that I like to gravitate to this small hole in the wall coffee shops. Thanks for sharing about this particular one. You mentioned Beachy’s Bulk Foods. We shop at Peachy’s Bulk Foods in Parke County, Indiana. 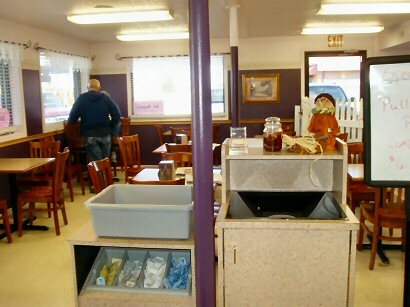 Comment on RJoselen's Amish coffee shop at Arthur , Ill. Thanks Erik and all. for the pictures of Arthur, especially Roselen’s coffee shop. 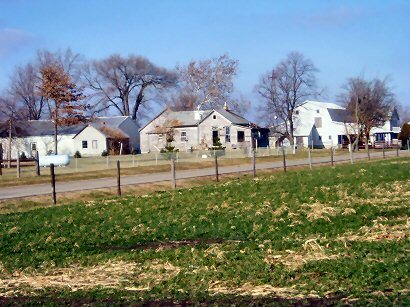 We are in MinneSNOWta, and we have been to several Amish settlements in IND, WI, MN,PA, Ohio, but have not been to the Arthur settlement, even though I have relative3s in Effingham, IL, which, I believe isnt’ too far away. (Am I right?) The pictures of that charming shop surely did whet my appetite, though. Thoroughly enjoy this blog AND learn LOTS frjom it. This is a neat coffee shop, can you dine inside ? Would love to go there…..Keep up the good work Alice…. Judy, from Effingham Arthur is really not that far. A quick shot up the interstate then a short drive through the country. You would enjoy it. I am finding different places to explore each time I go down there. Thanks Mona!! 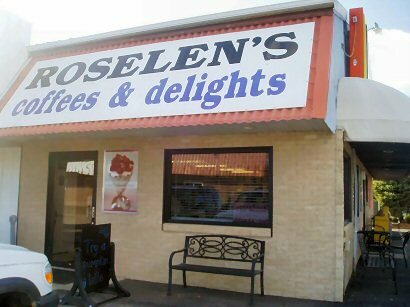 I really liked Roselen’s coffee but did not eat lunch there that day. Maybe next time I will give their food a try. They seem to do a pretty good business so I guess a lot of folks like it. 🙂 Still hope to catch a buggy at the drive thru sometime, LOL. Roselen’s has the best coffee. Their frozen coffee drinks are out of this world. When we (4)were there last, we had a chicken salad sandwich (great), a salad (great), a bowl of chili (good, but was very sweet), and a bologna and apple butter sandwich. I know it sounds really strange, but that sandwich was really good. We also each had one of their 24 flavors of soft serve, and liked them all. We’ll go back to there again. I’ve eaten in several places in Arthur, and this place and Country Cheese and More (downtown) are my favorites. Country Cheese has terrific food and their snicker doodles are out of this world. I always stop there and, at the very least, buy the snicker doodles. We will be in Arthur/Arcola towards the end of next month. Can anyone tell me addresses of the bent/dent salvage stores? Also addresses of Beachy’s Bulk Food, and Yoder’s Restaurant. We were there years ago and found a wonderful bulk foodstore somewhere around there but no idea what the name was. We had been at Rockhome Gardens and it was a great disappointment, hope the new owners will make it more enjoyable. Any suggestions of a nice Bed and Breakfast place in Arthur? The Chamber of Commmerce will be sending me info but I thought I might find more up to date info here. We are going to the Roseville, Il. store tomorrow, can’t remember its proper name. It’s fun to shop there and also at the two places in Cuba, Il. Yoders is on 133. Beachy’s is off of 133. The easiest way to find your way around is to go to the Information/Visitor’s Center on Vine St. in downtown Arthur and pick up a free map. If you are traveling from 133 north on Vine St. it will be up on your right in the old train depot. If you continue on north on Vine heading out of town you will see a sign on the left for “Discount Foods” not sure of the actual name but that will lead you to one of the bent and dent stores. Roselen’s is also on 133 next to Yoder’s and in the same building as the Dollar General Store. Try googling “Arthur, IL” for listings of B&Bs and other businesses in the area. Hope you have an enjoyable trip!! COUNTRY SALVAGE STORE is my favorite scratch and dent. There used to be two. This is the only one open that I know of. It is located on RR 2 BOX 81, Phone: (217) 543-2356. If you go insides, be sure to ask them where their candy is – ask for the pecan brittle and the English Toffee. They’re to die for. Just ask for directions at Yoders or Beachy’s. Another store you might be interested in Miller’s Dry goods – it’s out in the country not too far from Beachy’s. Ask them at Beachy’s. I can’t find them on the internet. Miller’s Variety downtown is cute and has lots of little novelty things. The guy that runs it is really nice. Abc Shop @ 2270A Cr 1800E – just outside of downtown, I believe it is north, has lots of games, puzzles, books and educational items. Enjoy your trip. There is also an Amish interpretive center in Arcola, which is just a couple of miles east of Arthur. They have a museum. You can also register there to tour an Amish home and eat a dinner in an Amish home. You might want to call ahead or stop there first thing in the AM. I love the Arthur, Illinois area! so much to see and do! can’t wait to go back again! 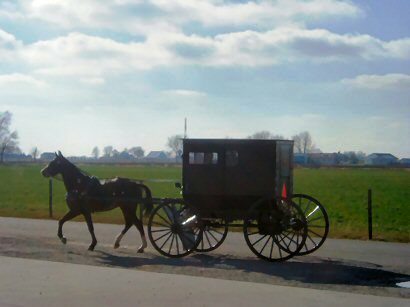 Do the bakeries, businesses, Amish restaurants allow electric? At least in Arthur, they use electric when required by the health code. Beechy’s has electric coolers for the cool/frozen goods, electric cash registers and as of 9/16, credit card machines. For lighting, though, they use skylights and kerosene. However, I think that building was purpose-built..or at least very easy to convert. In the case of Roselen’s, they are probably in a rented building which they are not allowed to convert, so they need to use the electric lights. Preparing the food with modern equipment is a health code thing. Thanks for sharing this interesting information about the Arthur area.